Borzog is an Orc student who can be found at the Old Goat Inn in Alcaire Castle. 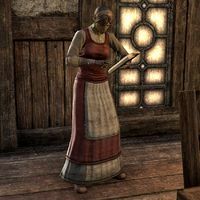 When spoken to, she'll say, "I don't know what's going on around here, but if you're looking for a good Orcish novel, I can offer a few suggestions." This page was last modified on 7 February 2017, at 21:01.